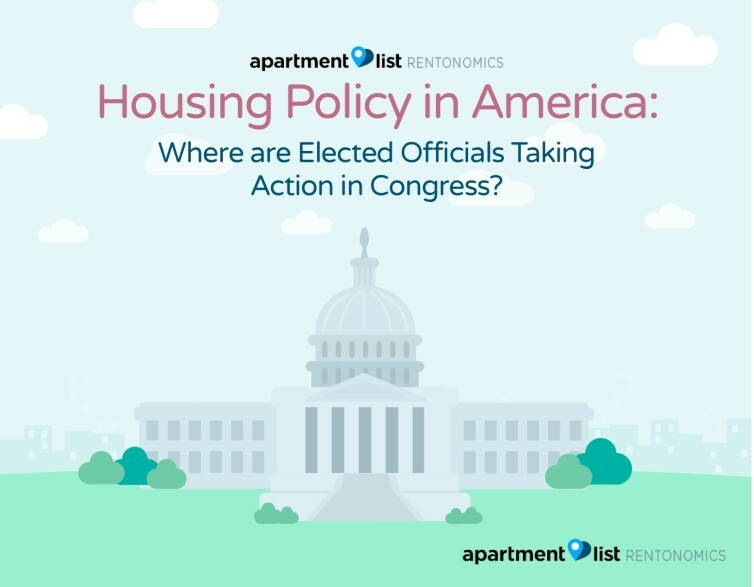 Housing Policy in America: Where Are Elected Officials Taking Action in Congress? Housing is the single greatest expense for many Americans, so its affordability directly determines quality of life and economic outcomes for many across the country. Throughout the nation, the cost of putting a roof over one’s head has continued to rise at rates that outpace wage growth for the average American, an alarming trend that impacts millions. Both federal and local government play a critical role in ensuring Americans have a place to call home. Over time the role of housing policy has changed based on the needs of the public as well as the policy priorities of those elected to represent us — but what does that mean for us today? 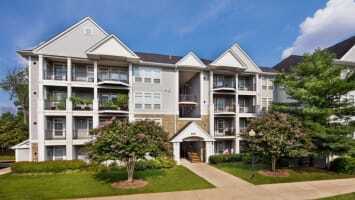 At Apartment List, housing affordability is something that we care deeply about. 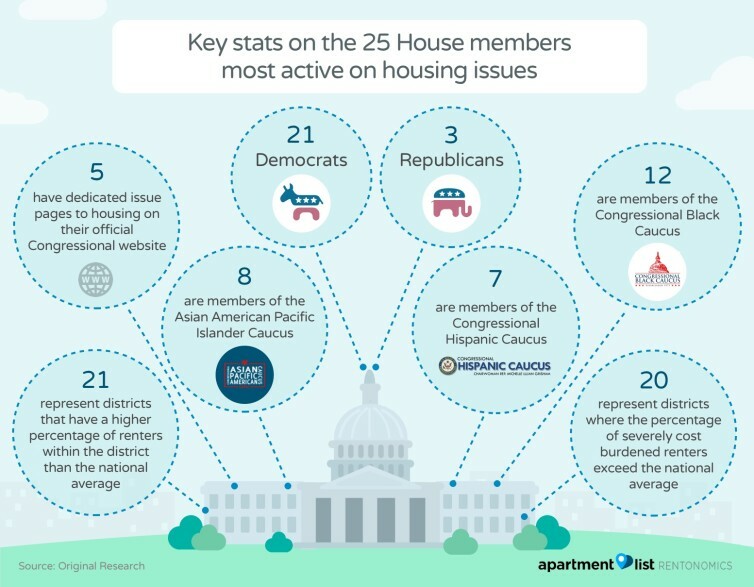 The question of how housing policy impacts Americans guided us to study what members of the 115th Congress are currently doing on housing policy and where we can collectively improve how our elected officials represent us. This could be an indication that although housing and its affordability are significant issues, Congress could be doing more to ensure all Americans have a place to call home. These numbers tell us elected officials have the potential to lead the way on the discussion for housing affordability, yet opportunities for leadership and visibility on the issue still exist. The conventional standard of housing affordability has been based on the share of total income spent on housing. 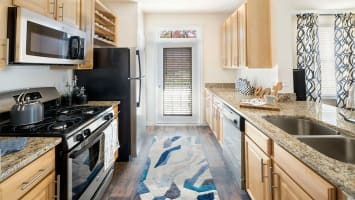 In 1981, the Federal Government outlined that a household should be spending no more than 30 percent of earned income on the physical space they call home and further, anyone spending over this threshold is considered “cost burdened.” However since then, spending 30 percent or less of household income on housing has become increasingly difficult for both homeowners and renters in many markets. 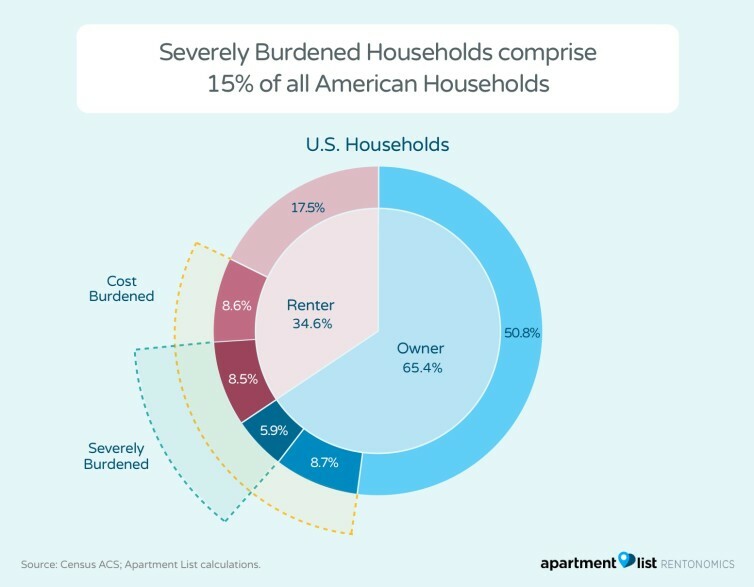 50 percent of renters identify as cost burdened (spend more than 30 percent of household incoming on housing), while 25 percent of renters and 10 percent of homeowners are severely burdened (spend more than 50 percent of household income on housing). As a result, the percentage of people severely burdened by the cost of housing accounts for 15 percent of all Americans, a worrying statistic as it represents a higher percentage than the official domestic poverty rate of 12.7 percent. Considering that 15 percent just captures those that are severely cost burdened, the total number of Americans who are cost-burdened encompasses not just those in poverty, but also many struggling to climb their way into the ranks of the American middle class. As elected officials continually and aggressively court middle class voters, this is an issue that should uniquely capture their attention. Despite being true at a national level; regions, states, and congressional districts are impacted differently by affordability, cost-burden rates, and how that correlates to elected officials advocacy for the issue on the congressional level. 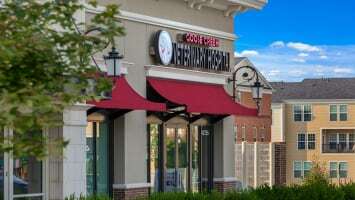 Recently, U.S. News and World Report along with McKinsey & Company created a ranking system of states based on the cost of living in each state, incomes, and housing costs and found that Ohio and Indiana were the most affordable states while California and Hawaii were the least affordable. This intuition would lead one to believe that in states where living was more affordable, Members of Congress would be talking about housing policy less while states that ranked low in the affordability rankings would be stronger advocates for housing policy at the federal level. However, based on our research and analysis, we found that to not be the strongest indicator for which Members of Congress were discussing this challenge faced by many Americans. Making change at the federal level through legislation poses a challenge that has become increasingly difficult over time. In the first session of the 115th Congress (January 3, 2017-January 3, 2018), 7,162 bills and joint resolutions were introduced in both the House and the Senate but less than 1.4 percent of those bills (1.4 percent of Senate bills and 1.3 percent of House bills) actually became law. This demonstrates that despite Congress generating many ideas, few of them can be agreed upon within and across the upper and lower chambers and make it to the Oval Office for signature. The lack of legislation passed into law during 115th Congress has been recorded as one of the least legislatively productive in the past three decades, meaning that passing substantive laws has become increasingly more challenging. This trend has been mirrored in housing policy as well. 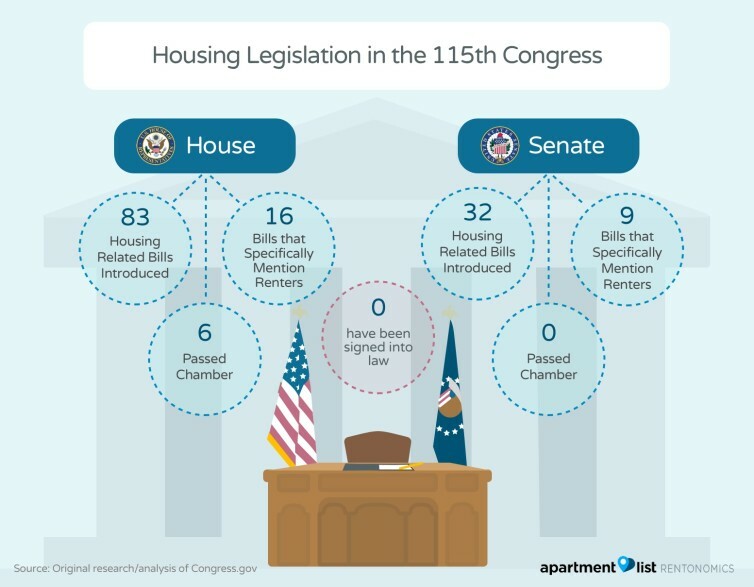 As we are still in the second session of the 115th Congress, thus far a total of 10,222 (and counting) Bills have been introduced in both the house and the senate- 115 of them related to housing, or approximately 1 percent of all legislation. Despite over 100 housing-related bills being introduced in the House and Senate, exactly zero have become law. This highlights a troubling sign as home prices are predicted to rise twice as fast as the speed of inflation and pay and nearly half of all renters in the United States are spending more than 30 percent of their incomes on housing. Regardless as to whether or not an individual aspires to rent or own a home, the issue of housing is not at the forefront of federal lawmaker’s minds. The issue of affordability in the housing market disproportionately impacts renters- a growing population across age, race, and educational attainment demographics. Many current federal housing benefits are geared toward helping those that own, exacerbating the issue of viability for those in the rental market. This trend can be seen in the 115th Congress in out of the 83 bills that the House and 32 in the Senate, 25 specifically mentioned supporting renters (16 in the House and 9 in the Senate). Despite the challenges of passing legislation and even steeper odds of passing housing legislation, the issue is not without advocates taking action in both political parties in both chambers. These advocates have been outspoken through levels of accessibility and transparency as well as sponsorship and co-sponsorship of legislation that has been introduced. Transparency and ease of access to information is fundamental to American democracy and the issue of housing policy is no exception. 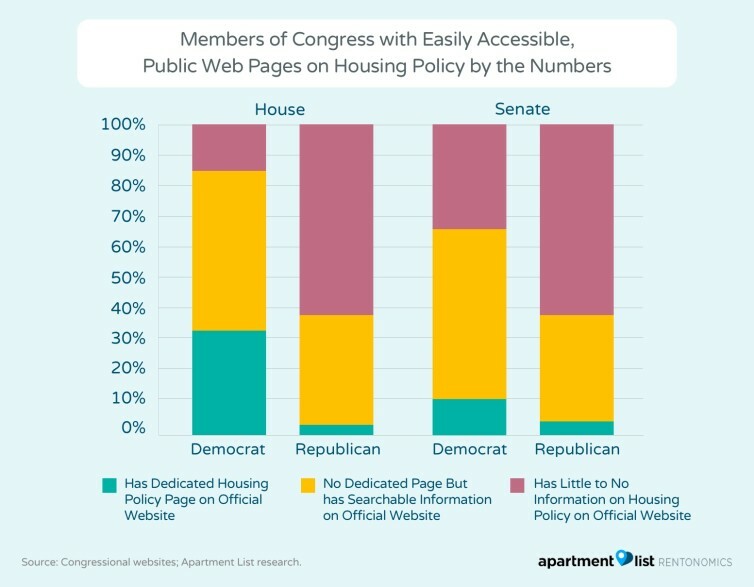 This study analyzed the websites of all 535 current members of Congress and found that just a handful of members made their stance on housing policy prominent and easily accessible. This study divides members of Congress into three categories: Has Page, Searchable, or Nothing. After analyzing Congressional websites, we discovered that just 14 percent of Congress has a dedicated housing issues page, while 44 percent has something related to their housing policy on their website, and 42 percent have little to nothing easily accessible to the public. Beyond access to information, members leading the way on housing policy are sponsoring and co-sponsoring legislation. This is one of the strongest public signs that a member of Congress is supportive of legislation and reveals the Representatives and Senators that are more outspoken advocates on the issue. We assigned a point value to sponsorship and co-sponsorship (1 point for co-sponsorship and 2 for sponsorship) of legislation and then compared that ranking to party affiliation, state affordability ranking, percentage of renters within the congressional district and state as well as the percentage of those renters that are severely cost burdened. It is clear that districts that have a higher proportion of renters lead the way on housing policy action. Regardless of state affordability scores, members that represent districts with a higher portion of renters than the national average and a higher proportion of renters severely burdened by housing costs are more likely to be taking official action that supports housing. Additionally, the majority of representatives that advocate for housing policy are minorities- potentially accounting for representation for a constituency that faces the lasting impacts of residential segregation throughout the country. Like in the House Representatives, states that have a higher than average concentration of renters and severely cost burdened renters are more likely to be leading the way on housing policy. 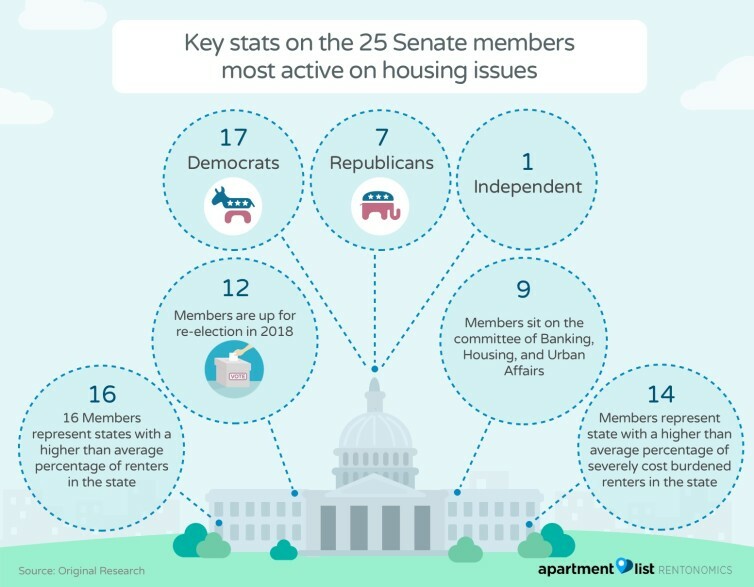 Even though we see senators from states ranked highly for affordability, it is evident that the percentage of renters can and does have an impact on housing policy activity in Congress. In addition to public websites as well as sponsorship and co-sponsorship of legislation, members of Congress can use their platform to as elected officials to give floor speeches that mention housing as well as speeches that are dedicated to housing. This is a strong indicator of support for various housing policies and can raise public awareness around the issue. Further, members of Congress are able to serve as advocates to constituents by writing letters to the U.S. Department of Housing and Urban Development (HUD) to shed light on issues faced in their home states/ districts. These letters often can have an impact on national housing policy and priorities but are difficult to quantify as Members of Congress are not required to share this data (or data on correspondence received from constituents) publicly. Members of Congress can also hold press conferences or meetings, and attend events in-state, in-district, or in Washington, D.C. – major indicators of support for policy yet difficult to quantify. Continued discussion and visibility on the issue of housing along with open lines of dialogue and communication with state and local elected officials as well as non-profit and grass-roots community organizations can ensure that housing policy priorities stay at the forefront of the minds of elected officials as they set their policy agendas in Washington and are an important part of the legislative process. Conclusion — What Can Be Done to Expand the Discussion on Housing Policy? “All politics is local” has been a popular phrase used by American politicos, but that statement is also true of policy- and housing policy in particular. Housing policy is something that impacts all Americans regardless of race, gender, creed, or socio-economic status yet it currently makes up less than 1 percent of all legislation put forth in the 115th Congress. Though we are one nation, pending many factors people experience housing and housing policy very differently. As the country continues to wrestle with prioritizing policy issues, citizens raising their voices within their community can often have the greatest impact. Expanding the conversation will require communities to hold their elected officials accountable and thoroughly vet the issues and policies that will directly impact their housing priorities as they head into the election. And perhaps there are early signs are already being seen. A recent analysis of 2018 candidates has shown that Democrats have nominated 133 people of color and 158 first-time candidates to run for the House of Representatives. If current trends continue this could mean housing policy could see more action in the next Congress starting in 2019. Regardless of the outcome of the 2018 midterm elections, come January, the 116th Congress will have its work cut out for them and their positions and priorities for housing policies can and will likely have major implication for all Americans for years to come. Pete is a policy analyst and communications specialist at Apartment List, combining data and story telling to help bring trends in the housing market to life. Pete has previous experience working for Deloitte Consulting, SKDKnickerbocker, and in the United States Senate. He holds a bachelor's in history and Africana studies from Union College and a master's of public policy degree from the University of Michigan.